You know that feeling you get when it’s snowing outside and you’re curled up in a blanket, sipping some hot chocolate and binging the latest Netflix series? That feeling can be described by one word: hygge. A newer lifestyle trend in the U.S., hygge is a Danish word and principle for the feeling of coziness and contentment. 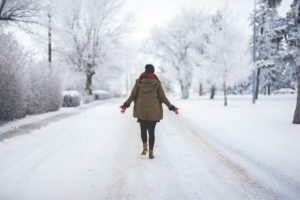 Whether you find that feeling in the company of others or in the solitude of time for yourself, hygge is an important feeling to have and recognize; and there’s no better time for it than the seemingly endless cold of winter. 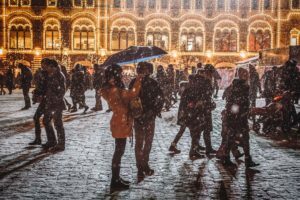 Now that a new year has just begun, having a hygge state of mind can help you live this year to its fullest and get the best out of it. 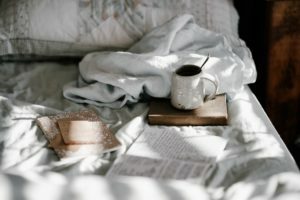 If you’re stuck on how to start recognizing hygge and bringing it into your life, look no further than our tips below. For some people, looking for the warm and cozy is literal while for others it’s more psychological. Either way, a huge part of recognizing hygge is knowing the contentment that comes along with being warm and cozy. When looking for this feeling literally, it is often found with a soft blanket. Chunky knit blankets are a big trend right now and go well with feeling comfortable and cozy because of how soft and warm they are. The psychological warm and cozy comes from being around people or things that evoke that feeling. Surrounding yourself with those people and things will keep you calm and happy even on the darkest winter day. Sometimes, you just need a day where you do absolutely nothing and camp out on your bed. While some people may shame you for this, there is no reason to let their opinion bother or affect you. You know what’s best for your well-being and contentment and a day to stay in bed and do nothing or choosing to stay in bed longer is the best way to reset. One thing’s for sure, you want to make sure you’re extra comfy on those days. It all starts with a good base, meaning mattress; so you need the best and most comfortable one you can find. From there, find the right sheets and comforter that are both comfortable and represent you. Choosing something you love and that feels good puts you in a better mood and makes your bed a place you want to spend time. When trying to achieve a feeling of comfort and contentment, nothing is worse than harsh, bright lights. They are hard on the eyes and don’t work to make you feel relaxed. Replacing some of your lights with a softer light bulb or even installing a light dimmer can help in these situations. Another option you have is lighting candles, which is a huge component of hygge in Denmark. Specifically, lighting candles that have certain scents work doubly to boost your mood with soft lighting and a relaxing smell. The key to hygge is that it is different for every person. While everyone is looking for that same feeling of contentment and coziness, the methods to get you there can vary slightly from person to person. While some feel most comfortable and happy being surrounded by others, someone else finds comfort in having time to themself. In order to fully realize hygge, you have to do what is best for you and what will ultimately make you happy.